Here at The Wedding of my Dreams we love seeing how you use our wedding decorations at your weddings. All of you put your own spin on our decorations and use them in different ways to suit your personal style. 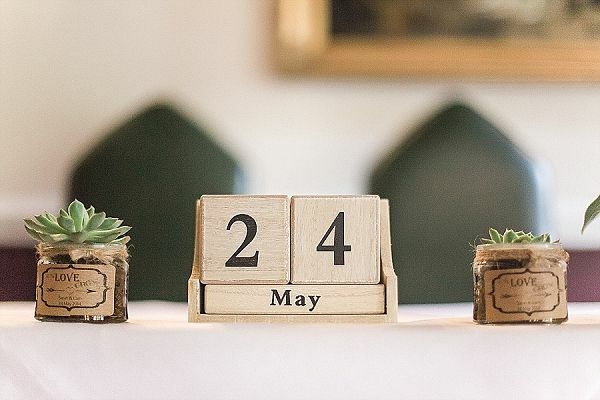 In this blog post we have chosen a few of our favourite images, showing different ways of using our wedding decorations. We hope it inspires you. 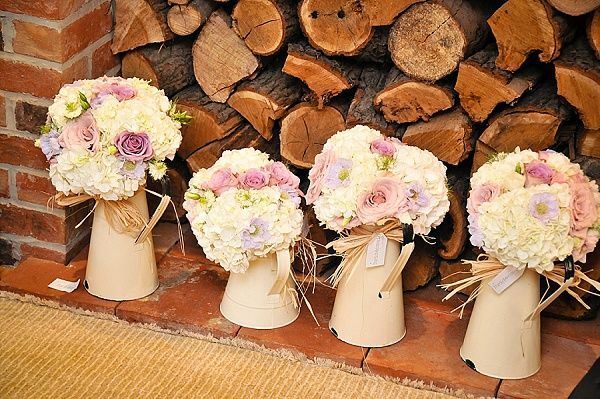 Here our cream jugs have been used to display the brides and bridesmaids bouquets when they are not being held. 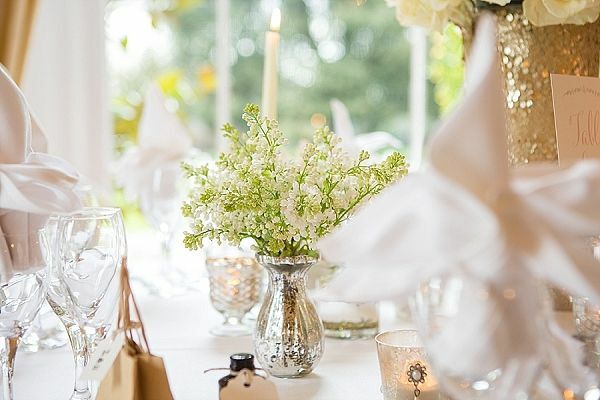 This not only keeps the flowers fresh on a hot summers day but creates extra floral decorations which can be used around your venue – and your wedding guests can see and smell the bouquets more closely. 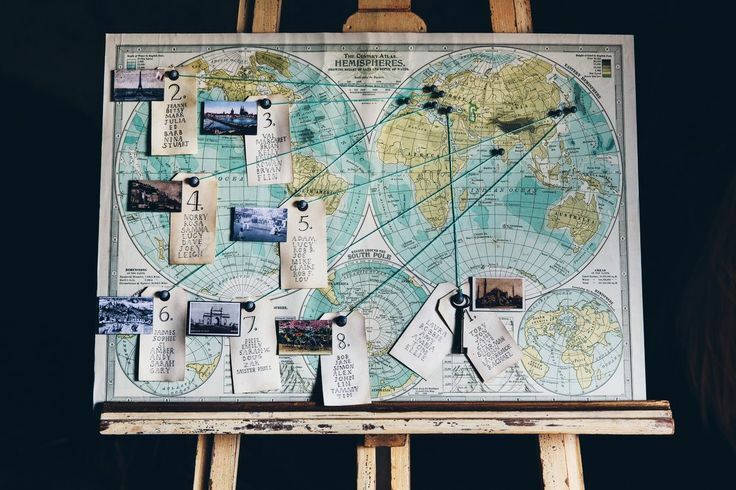 Our world map print has been used here as a lovely travel inspired table plan, the tables have been named after different countries around the world. 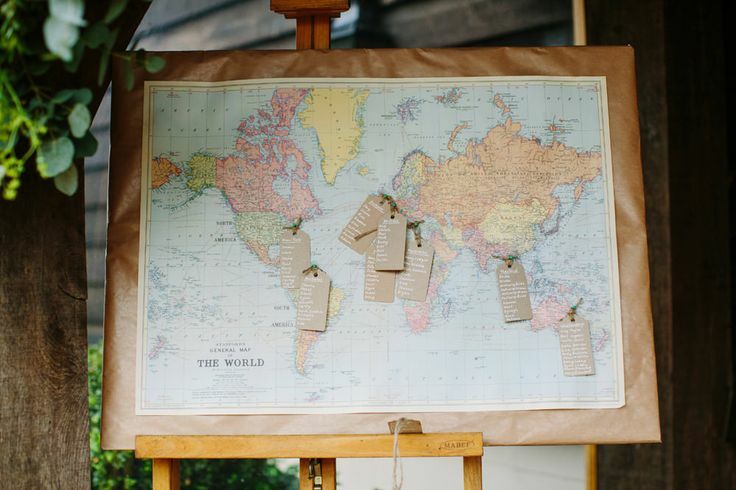 Similarly to above our world hemisphere map has been used as the table plan. 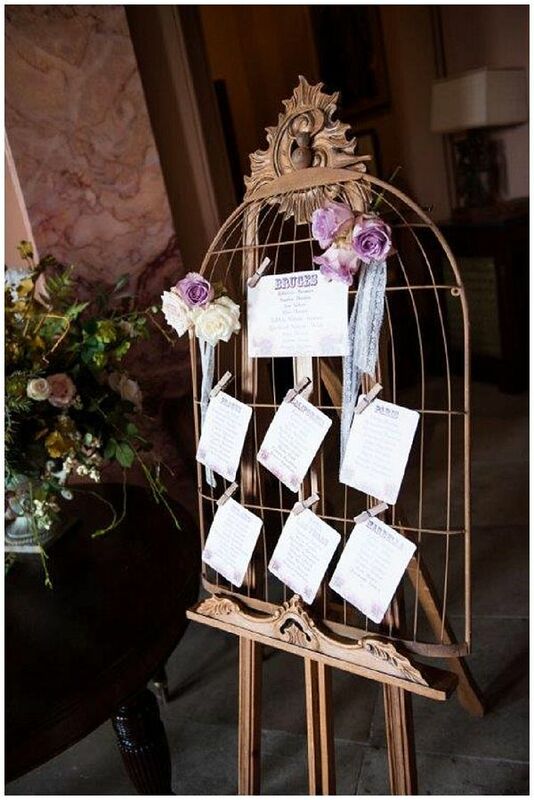 Our birdcage table plan has been used here with lovely cream and purple roses to decorate. We think this looks lovely on the ornate wooden easel. 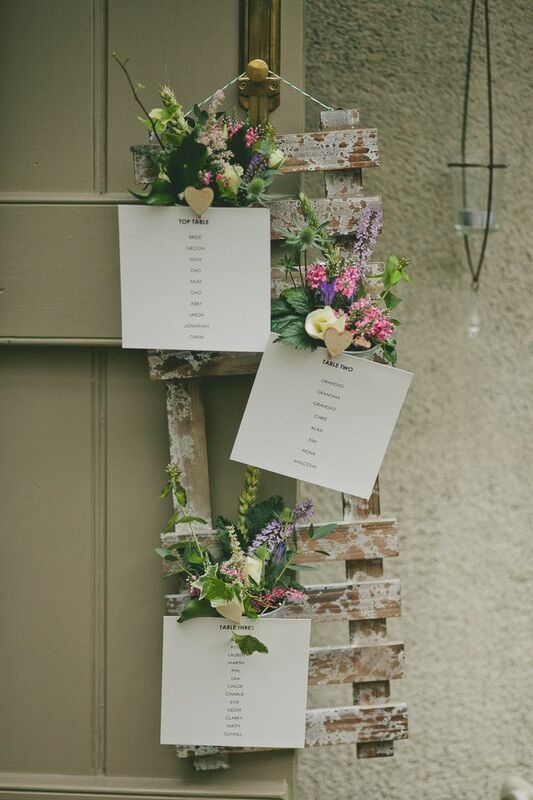 This couple used our rustic table plan and filled the flower pots with lovely bright summer flowers to complete the country rustic look. 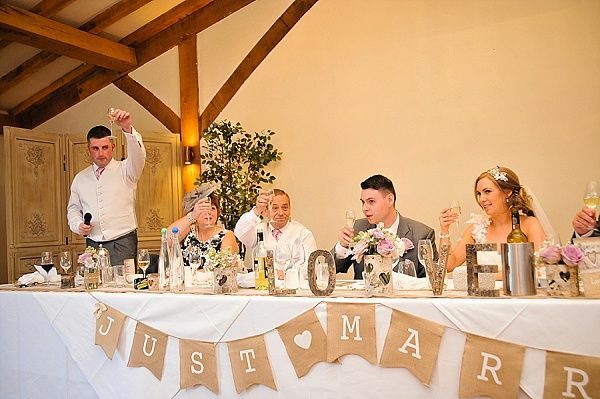 We often see our just married hessian bunting hung from the entrance of venues and wooden beams in a barn wedding, but we love the idea of hanging the hessian just married bunting from the front of the top table. This frames the newly married couple perfectly throughout the wedding breakfast. Here our distressed cream jugs have been used as centrepieces, filled with beautiful blooms including peonies, hydrangeas, dahlias, veronica and roses. To give a little extra interest to the centrepiece the jugs have been placed onto of a stack of books with crystal vases around the base. 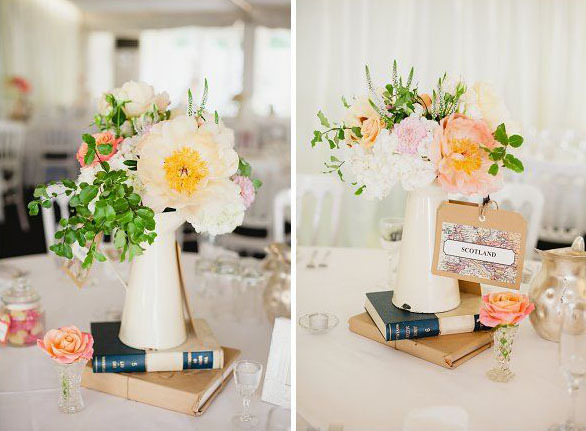 Love the choice of colours at this wedding, the peach David Austin roses look stunning against the vibrant green. 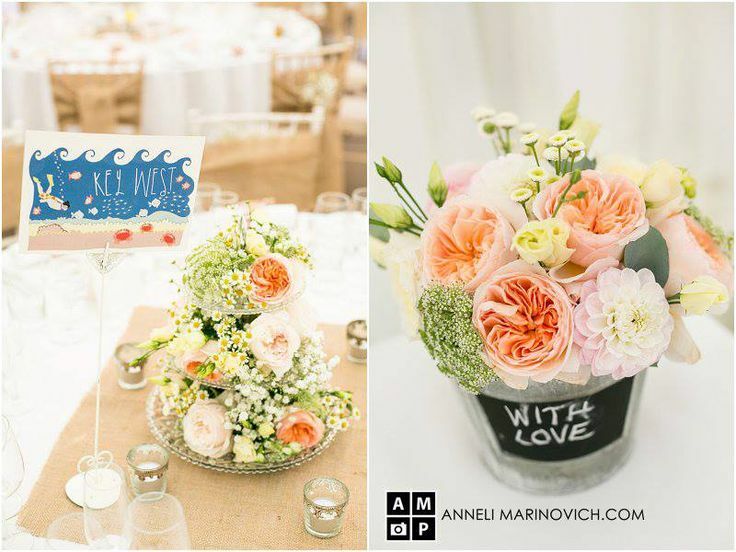 Here our glass three tiered cake stands have been used as elegant centrpeieces and our blackboard buckets were given as “thank you flowers”. We love this centrepiece of peonies and hydrangeas in a beautiful silver footed bowl finished off with 6 of our mercury silver candle sticks. 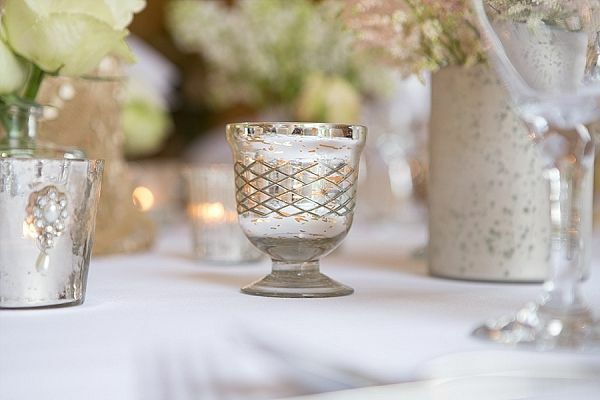 One of our mercury silver tea light holders used here around the base of a larger floral arrangement, we think it looks stunning mixed in with other silver items. 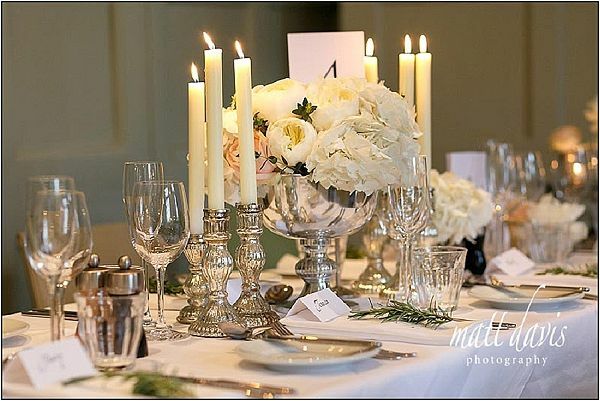 This is the same table as above, our mercury silver vases were added around the main centrepiece vase for more impact. 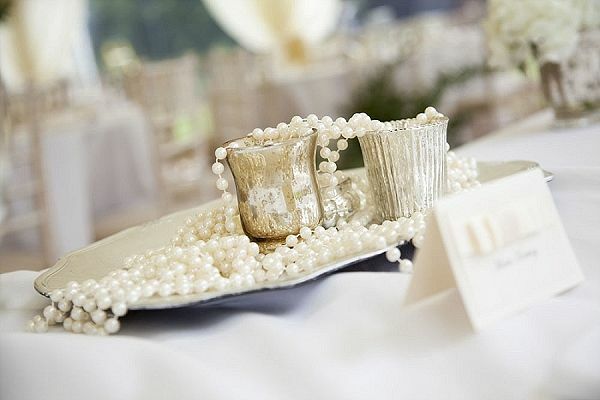 Sticking with our mercury silver items our ribbed mercury silver tea light holders look lovely displayed on this silver plate with elegant pearls. 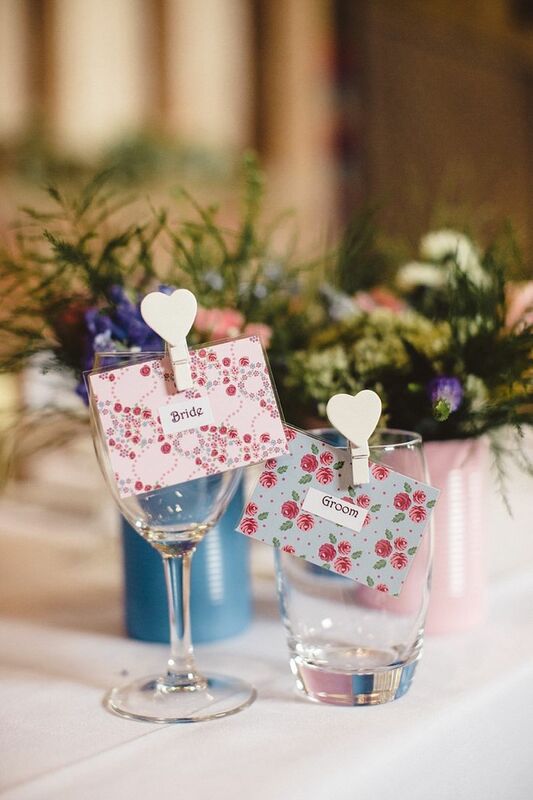 Our white heart pegs were used to peg these pretty floral place cards to the wine glasses of each guest. 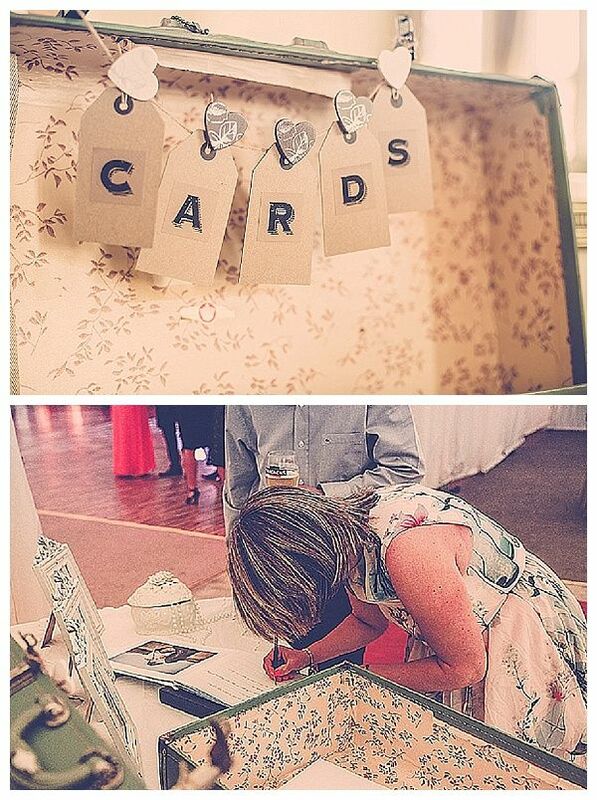 We love this idea, it makes the names easy to see and saves space on the tables. We think these cute succulents planted in jam jars make lovely favours with our personalised let the love grow stickers. 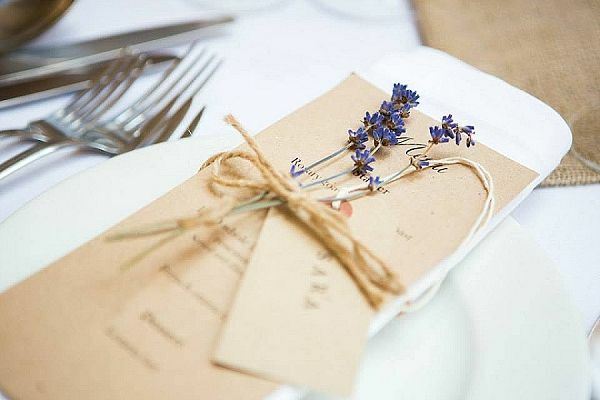 A couple of stems of dried lavender on each guests place setting is a lovely touch, and perfect for a country rustic wedding. This will bring a gorgeous scent to the tables too. 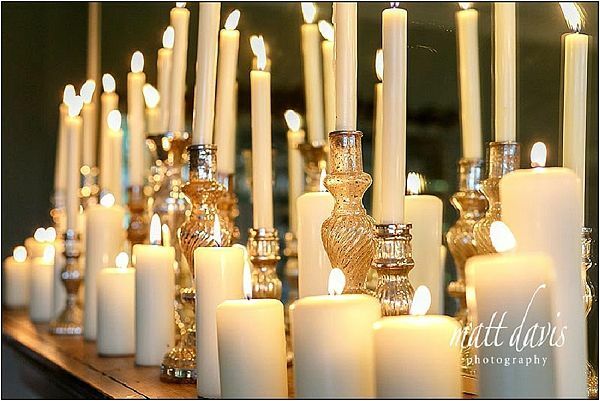 I know we have already featured our mercury silver candle sticks used on a wedding table but we couldn’t resist sharing this photo too. We just love this mantle piece full of candles in different shapes and sizes with a row of our mercury silver candle sticks against the mirror. 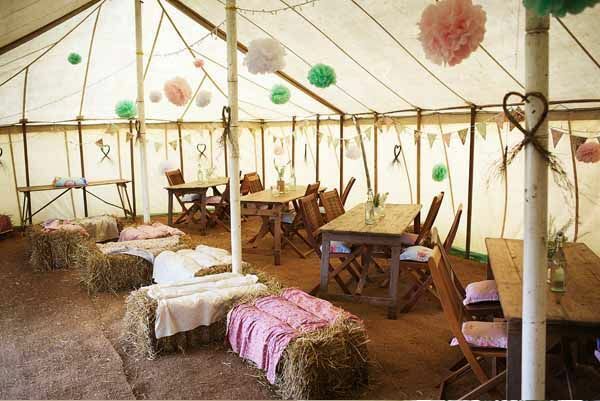 We love the use of our paper pom poms in mint green, blush pink and white in this rustic marquee. They look amazing hanging from the ceiling and the bales of hay covered with blankets make a great seating area. 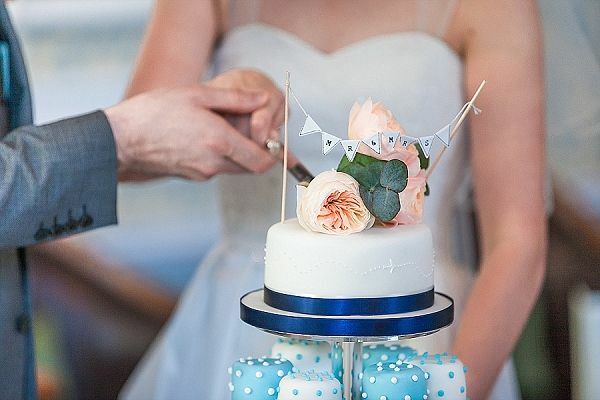 Our mini bunting cake topper looks perfect on top of this cake framed with peach David Austin roses. How delicious does this look? 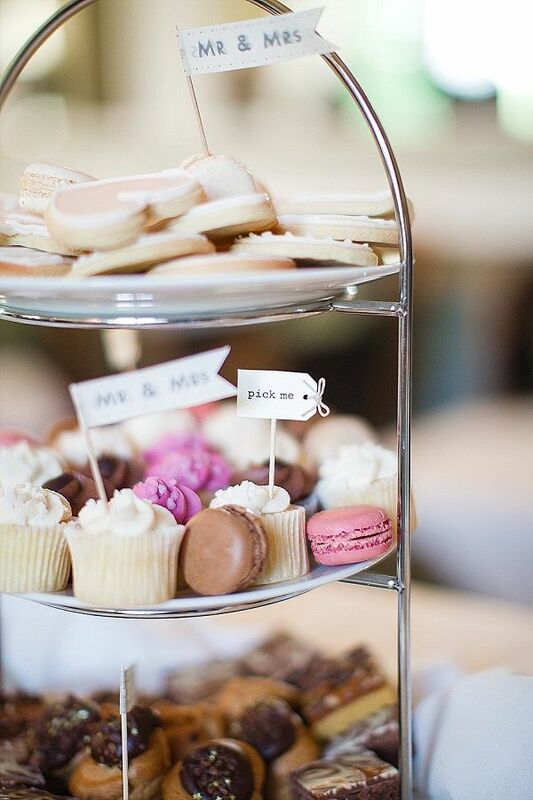 We love the addition of our vintage tea party cake flags on the little cupcakes. They also made their own Mr & Mrs cake flags from our decorative tape and cocktail sticks. Our rustic alphabet stickers have been stuck onto luggage tags here to spell out the word CARDS. Hanging this from the lid of a vintage suitcases make a lovely place for guest to drop their cards and write in the guest book. 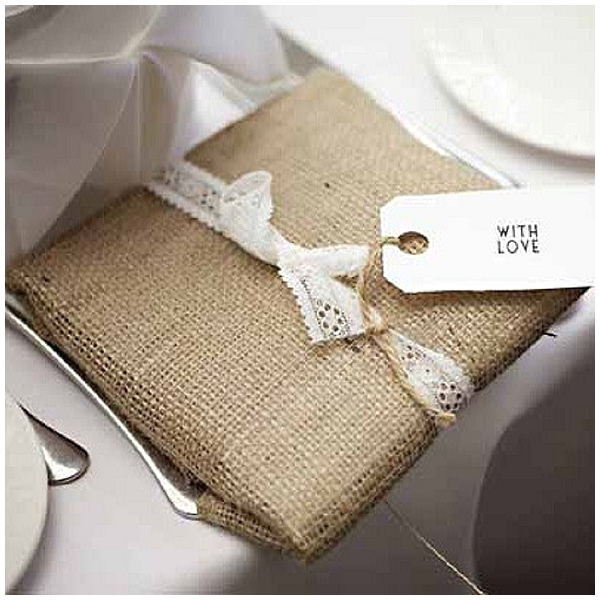 Love this creative way of using ur hessian burlap fabric. Use the fabric to wrap gifts and tie with lace ribbon. 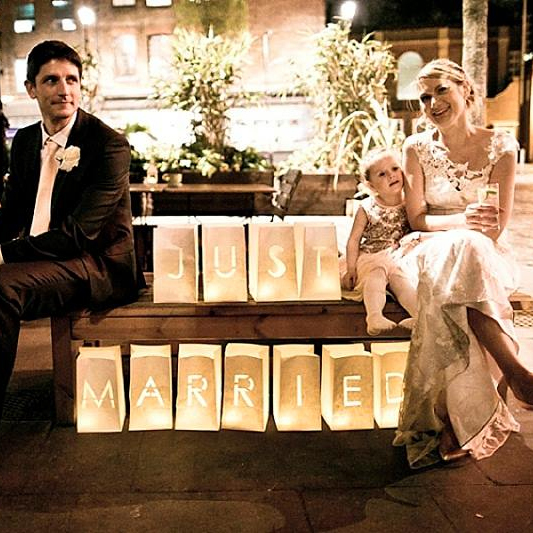 What a lovely photo, our Just Married lanterns can make a real statement at weddings. We love this.